NASHVILLE, Tenn. — Most churchgoers will put up with a change in music style or a different preacher. But don’t mess with a church’s beliefs or there may be an exodus, according to a new study from Nashville-based LifeWay Research. Thirty-five% have been at their church between 10 and 24 years. Twenty-seven% have been there for 25 years or more. Twenty-one% have been there less than five years, while 17% have been at the same church for between five and nine years. Lutherans (52%), Methodists (40%) and Baptists (31%) are most likely to have been at their church for 25 years or more. Fewer nondenominational (11%) or Assemblies of God/Pentecostal churchgoers (13%) have such long tenure. “Most church members have been at their church longer than their pastor,” said McConnell. More than half (57%) of churchgoers say they are completely committed to continuing to attend their current church. About a quarter (28%) are “very much” committed, while 11% are moderately committed. Two% are slightly committed, while 1% are not committed at all. The more people go to church, the more committed they are to attending their same church in the future. Those who attend at least once a week are twice as likely to be completely committed to attending their church (62%) than people who go once or twice a month (31%). Those who attend once or twice a month are more likely to be moderately committed (36%) than those who go at least once a week (7%). Churchgoers with evangelical beliefs are more likely to be completely committed (67%) than those who don’t have evangelical beliefs (45%). Baptists (60%) are more likely to be completely committed than Lutherans (47%). About two-thirds (63%) of churchgoers who are 65 or older are completely committed to attending their same church in the future. That drops to 50% for those younger than 35. Older churchgoers are also least likely to want to leave their church. When asked if they’ve thought about going to another church in their area, 92% of those 65 or older say no. Overall, 15% of churchgoers say they have thought about going to another church in the past six months. Eighty-five% say they have not. Of those thinking about going to another church, about half (54%) have already visited another church. Forty-six% have not. For the most part, churchgoers say they agree with their church’s teaching. About half (52%) say their beliefs are completely aligned with those of the church. Forty-two% say their beliefs are mostly aligned. Fewer than 3% say their beliefs are slightly aligned, not aligned or they don’t know their church’s beliefs. Education plays some role in how churchgoers view their church’s theology. Churchgoers who have graduate degrees are less likely to accept all their church’s teachings. Only a third (35%) say their beliefs are completely aligned with those of the church. Sixty% say their beliefs are mostly aligned. Two-thirds (62%) of churchgoers who have evangelical beliefs say they are completely aligned with their church’s theology, while a third are mostly aligned. By contrast, 39% of churchgoers who don’t have evangelical beliefs say they are completely aligned, and about half (53%) are mostly aligned. Sixty% of churchgoers at big churches—those with more than 1,000 attenders—say they are completely aligned with their church’s theology. That drops to 46% at churches with fewer than 50 attenders. Baptists (57%) and nondenominational churchgoers (61%) are more likely to say they are completely aligned with their church’s theology than Lutherans (43%) or Methodists (25%). 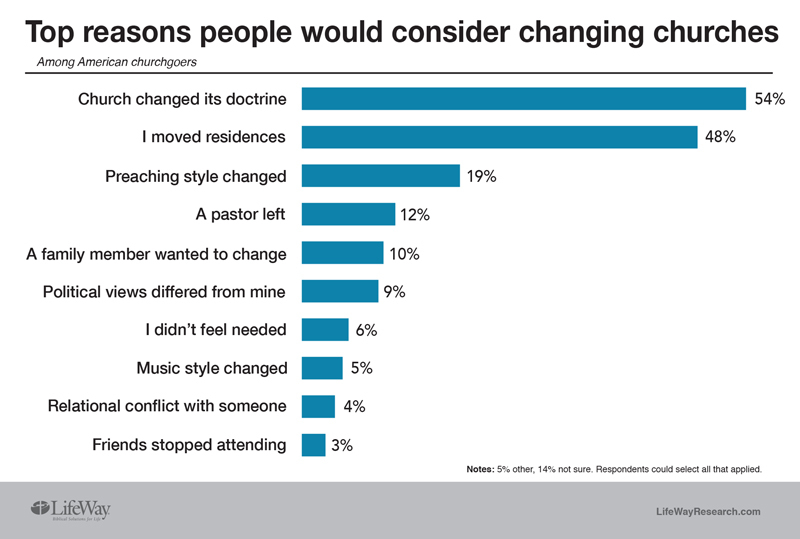 Still, churchgoers don’t like to see changes in their church’s doctrine. More than half (54%) say they’d seriously consider leaving if church doctrine changed. 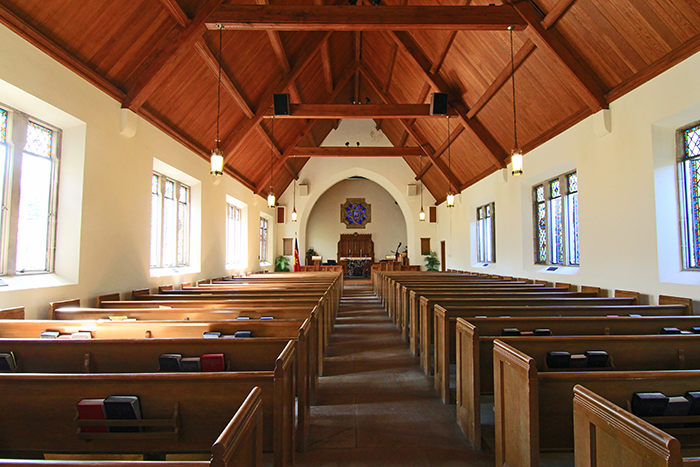 Researchers asked about other factors that might cause churchgoers to switch churches. Nearly half (48%) would change churches if the churchgoer moved to a new home. 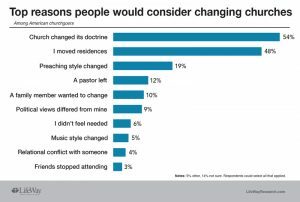 Some churchgoers would leave if the preaching style changed (19%), if the pastor left (12%) or if a family member wanted a new church (10%). Nine% say they would leave over politics. Fewer would leave if they didn’t feel needed (6%), if the music style changed (5%), if they had a conflict (4%) or if a friend stopped attending (3%). The survey shows churchgoers care about doctrine, said McConnell. “Still, pastors can’t assume everyone in the pews agrees with their preaching,” McConnell said. “Overall, 94% believe most or all of their church’s teaching. But there’s still substantial wiggle room. Most churchgoers think their church is doing a good job. Three-quarters (76%) think their church has been either extremely helpful (36%) or very helpful (40%) in their spiritual growth. Sixteen% say the church is moderately helpful. Relatively few say the church has not been helpful (1%) in their spiritual growth or are not sure (2%). 27% want their church to help them understand more about God and the Bible. 20% want their church to help them find new ways to serve. 19% want their church to provide more Bible study groups. 16% want their church to help them get to know more people in church. 14% say their church could provide forums to answer their spiritual questions. 13% want their church to give them more chances to serve. 13% want their church to provide worship experiences that fit their needs. 9% want their church to provide more interaction with the pastor. 8% want their church to provide them with a mentor. At any given church, about 15% of the congregation is thinking about leaving. If they go, the church could suffer. Bob Smietana is senior writer for Facts & Trends . Sample stratification and base weights were used for gender, age, race/ethnicity, region, metro/non-metro, home ownership, education and income to reflect the most recent U.S. Census data. Study-specific weights included for gender by age, race/ethnicity, region and education to reflect GSS 2016 data. The completed sample is 1,010 surveys. The sample provides 95% confidence that the sampling error does not exceed plus or minus 3.1%age points. Margins of error are higher in sub-groups.